The last post was something that seemed to resonate with a lot of you. The funny thing is that I am one #1 multi-tasker there is and IT IS BAD! Ever since writing that post, the Pro Sulum staff and I have been trying to narrow what we do down to one thing. It's very hard to do since doing a lot of things always make you feel like you are doing more than you really are. Essentially, when you only do one thing if feels as though all of the other stuff that you could do will be lost. Anyway, if you haven't read the 1-1-1 method post than you can read it here. Since starting the method there has already been a huge increase in productivity. Not just in doing things, but in producing. The single task that was the main focus for us was a new WordPress plugin. The idea for the plugin came to us while we were doing some sites for clients and we always recommended to them that they have one clear call-to-action for their website. This would allow them to capture leads and be able to sell products or services directly to prospects via email that would benefit them. Well, what if not only their website had a clear call-to-action, but every single blog post? That is, most companies and bloggers blog about various topics that may not be in line with the value proposition shown in their email opt-in they currently have. Why have the ability to create a call-to-action that is in context with the content of a blog post? It would be super powerful. For example, this site is all about productivity and some small business stuff. However, there is a blog post that was made a while back that had to do with creating a proposal. Now, we started getting a bunch of traffic to that one post, but we didn't have anything to capture leads with other than an invitation to join the newsletter. So we created a call-to-action to download a proposal template by signing up to the newsletter. The email list opt-in rate went through the roof. We ended up getting about 300 people on the list in less than 2 months. The only problem was that they were going onto my main newsletter list. Nearly all of the people who were opting in weren't interested in productivity or small business. Eventually, the list was cleared out. Eventually, we learned that having a very well-written and marketed post can bring in a ton of visitors. Not only that, having a specific call-to-action can build your list fast. That being said, we focused on one thing and created Magic Action Box. It solves 1 problem. Creating simple, beautiful, and specific call-to-action boxes for WordPress. The power of the 1-1-1 method allowed us to finish this in 2 weeks and spend the rest of the time setting up the marketing campaign for it. What are you going to focus on this month? It's all about action – focused action. What is the one thing that you are going to do this month that will result in something produced? It doesn't need to be something that makes money, it can be something that brings you closer to God, your family, or friends. It can be something that makes you a better employee. Hey Dean, hope you are doing well. For some reason I always find myself in this position where I feel that if I just do one thing it feels as though all the other stuff I could do will be lost. It’s a constant struggle but I definitely agree with you that doing too many things directly affects quality. Even right now I’m thinking about that one thing I want to focus on this month, but as usual, more than one come to my mind. I feel very strong about one thing though, finishing studying for this certification test I want to take next month, so I guess that will be my main focus for this month. 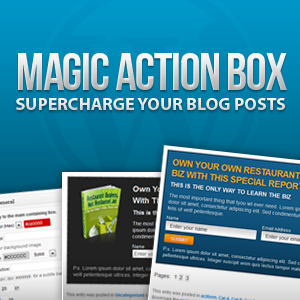 I like your idea of having a well well-written and marketed post along with the magic action box. People won’t feel overwhelmed with information since it would be very specific. How has the magic action box worked for you? Haha, see… It’s scary. But you can totally do it, my friend. It makes a HUGE difference. What is the certfication you are going for? You’ll find that you will get WAY more done focusing on 1 thing. Plus it’ll motivate you to do more! Magic Action Box is doing really well actually. Over the last few days it has made a considerable amount of revenue. Was a bit scary since there are support issues that come up and the need for good customer service – never created an application of sorts other than an iPhone app so this was new territory business-wise :). Got your email. I’ll send you an invite to the mastermind group ASAP.